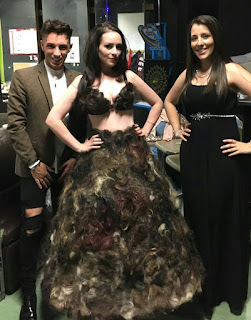 Buzz Kill Ramblings of Tim Louie: THE PUBIC HAIR DRESS.....THAT'S ALL! Am I the only one gagging at the site of this dress? This British woman whose goal was make a dress more hair-raising than Lady Gaga's infamous meat dress may have succeeded beyond anyone's expectation. This is Sarah Louise Bryan. She recently unveiled a bra and skirt outfit made from pubic and head hair donated to her via her Twitter page. The 28-year-old designer was inspired to create a design to outdo Lady Gaga's infamous outfit at the 2010 MTV Video Music Awards. She said, "I really wanted the world's most unique and disgusting design, so when someone sees a design they know it was me instantly. According to Bryan, she got the donated hair mostly from British men, "plus the odd American," who sent her the hair in envelopes. The hair came mostly from brunettes, but there is a red and grey pubic hair in the mix as well. She claims that she sterilized the hairs before applying it to a pre-cut bra and skirt with hot glue. Oh my God! I'm gagging at what these hairs must have even just smelled like. I wish all of you can see my face right now as I type this story. It's definitely a look of disgust. It took Bryan six months to get enough pubic hair to create the dress. She kept the donated strands wrapped in a cling wrap in her 13-year-old son's bedroom. She said, "I didn't tell him the truth but he has the whole second floor of the house so it's a big area. The hardest part was keeping all of the hair in one piece." When it came time to put the outfit together, things got a little hairy. She even started gagging while working on the dress. She said, "I set to work with my eye mask, breathing mask and thickest gloves I could find, because who want to eat pubic hair?" I've had a few hairs stuck in my teeth back in the day. What's wrong with that? Bryan said, "I thought of the design because of how gross it is. I thought, 'What would be the worst thing to have on your dress?'" This isn't the first time Bryan has created an outfit that has grabbed the fashion world by storm. Last year, she created a dress made from 3,000 Skittles worth $6,500 that became a viral sensation until the dress melted earlier this year while being transported to Los Angeles. Talk about tasting and wearing the rainbow. Bryan is willing to sell her pubic dress for the right price and to the right person. She says that she would only sell the dress to a high profile celeb like Gaga or a museum. I have to admit that Bryan has a decent sized rack, so she might have to resize the top portion for anyone who want to buy this disgusting dress, though it will be unique. She already has 300 offers....I'm sick to my stomach! Time for lunch!